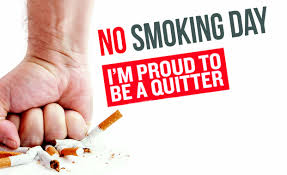 It is just over a week until No Smoking Day on Wednesday 14 March, with thousands of smokers across Northern Ireland today being urged to stub out their cigarettes and become ‘Proud Quitters’. Make a date to give up – and stick to it! This year’s No Smoking Day is Wednesday 14 March. Get support from your local stop smoking service. Also, let your family and friends know that you’re quitting. Some people find that talking to friends and relatives who have stopped can be helpful. Treat yourself. If you can, use the money you’re saving by not smoking to buy yourself something special. For more information on the services available and useful tips to stop smoking, visit the PHA’s Want 2 Stop website at www.want2stop.info where you can also order a Quit Kit free of charge which will help you plan your quit attempt.